When an iOS 12.2 device is enrolled in WorkspaceOne (1902) internal and VPP Apps are not installed. We’ve also been able to pin point this to devices that have a default Wallpaper deployed. Our devices that do not have a default Wallpaper defined, install Apps fine. We have escalated to VMWare and I’ll update if this progresses or once resolved. Has anyone else come across this issue? Interesting issue, I have not seen this kind of issue in our current 12.2 testing on multiple EMM’s. Do you have a bit more detail on what configuration you are deploying or have you been testing with just the wallpaper and apps? Do the xCode logs provide any insight into the install issue? Is your device supervised and enrolled via ABM/DEP or is this a BYOD enrollment? * Do you have a bit more detail on what configuration you are deploying or have you been testing with just the wallpaper and apps? 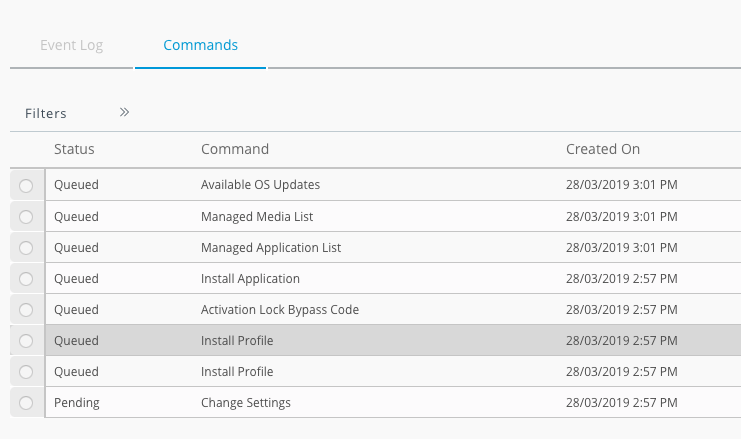 Our standard configuration contains a number of profiles, including Wi-Fi, certs, and a number of weblcips, but these all install fine. We also replicated this on a minimal configuration with just a Wi-Fi profile, webclip and one VPP App (WS1 Hub) installed. * Do the xCode logs provide any insight into the install issue? I’ll see if I can get some logs but I’ve attached a screenshot of the commands queued in the WS1 console. * Is your device supervised and enrolled via ABM/DEP or is this a BYOD enrollment? Apple DEP enrollment, use case for most of these is corporate shared, so as pool devices or Kiosks (but no multi-user profiles). Also as the device is trying to install Wallpaper, screen goes black, then shows “cog” then goes back again (hard to one to describe). As Apple are still signing OS 12.1.4, we are currently working around the issue by down grading devices at the moment, prior to enrollment. I tried uploading Xcode logs in XML format and recieved “Sorry, new users can not upload attachments” error, even though I uploaded PNG previously. XML file is over 17MB. I have not been able to replicate the fault you are seeing, are there any other variables you would like me to try? Let me know if you can tried to isolate a device to a test area and verified basic profiles and application installs. We have also tested an iPhone on 12.2 with a multi-user staging account that has wallpapers set by the OG the device lives in, and all the apps install as expected. That being said, let us know what VMware says! Thanks for testing all, it definitely gave a fresh perspective! VMware were able to replicate the issue in our environment, they produced a mountain of logs, but weren’t able to provide anymore insight than that. We weren’t able to reproduce the issue in other AirWatch environments. However, we were able to reproduce in our production environment, in test OGs, with the same Wallpaper, with and without DEP. But we were able to remedy the issue in our test environments with a smaller version of the Wallpaper image size. So it seems this issue was a combination between iOS 12.2, our AirWatch environment, and the wallpaper image file. (For reasons unknown to me) The original Wallpaper seems to be over 5 times the size it needs to be, which caused the issue. However, has never caused an issue with any iOS version in the past 5 years (including iOS 12.1.14), except for iOS 12.2. I’m looking to change the Wallpaper to the smaller image file tomorrow in production, so fingers crossed, this resolves things once and for all. I’ll update with the final outcome, and thanks again for all the input!